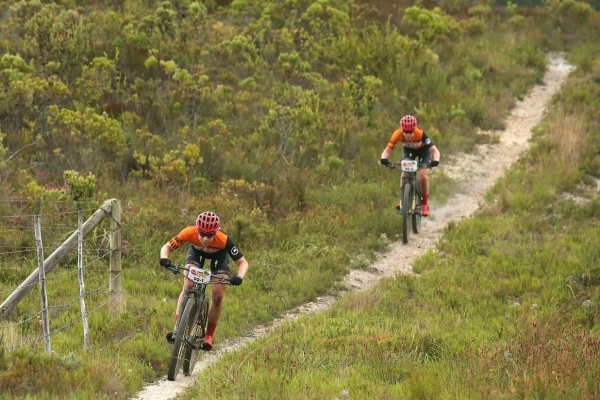 After just two days of racing at the Absa Cape Epic, the Investec-songo-Specialized duo have already opened up a massive five-minute 42-second lead over Kross-Spur Racing’s Ariane Lüthi (Switzerland) and Maja Wloszczowska (Poland). At the finish, after five hours, nine minutes and 11 seconds of riding, the Danish / Dutch combination had extended their stage lead to 3:07 with a controlled ride. Wloszczowska was pleased with Stage 1 despite a tough 111km ride where they struggled to hold off the third-placed- Summit Fin team of Candice Lill and Adelheid Morath. “I have a huge back pain, but otherwise it was all good,” said Wloszczowska. “We tried to keep the pace steady so we can reach the finish without hitting the wall on the way, but it was a hard stage. “If we had tried to go with (Langvad and Van der Breggen) it would have been quite risky with 111 kays, so I hope they enjoyed the ride. I am happy we are still only three minutes back. I think for five hours of racing it is not really a lot … I was expecting a lot more so I think it is still close.” Wloszczowska added. Close is a relative term, but Van der Breggen’s minor tumble will also serve as a warning that although Investec-songo-Specialized are clearly a step above their rivals, the nature of mountain biking means victory is never guaranteed and a mechanical or a fall can shake up the leader board at any time. In the race for the African Women’s jersey race, the dormakaba Ladies team of Samantha Sanders and Amy Mcdougall added 13 minutes to their advantage over the Galileo Risk pairing of Theresa Ralph and Sarah Hill and now lead the jersey by 42 minutes. Tuesday’s Stage 2 is relatively short in kilometres, but with 2 250m of climbing packed into the 86km stage from Hermanus to Oak Valley, the day will still be a tough test likely to be remembered by the riders for the brutal six kilometre Wildekrans Tokoloshe that gains over 500m in one tough climb.